American Muscle is celebrating the 100th anniversary of Chevrolet with these special chrome edition die-cast muscle cars. These classic cruisers are impeccably recreated with serialized chassis and painstaking attention to detail. The Chevy Centennial series includes the following cars: 1966 Chevy Chevelle SS 396, 1967 Chevy Corvette Convertible, 1970 Chevy Chevelle SS 396, 1969 Chevy Nova SS 396 and the 1971 Chevy Camaro Z/28. These cars have detailed engines, accurate interior and flocked carpet. These cars will be roaring into stores by August. Visit autoworldslotcars.com/americanmuscle for further information. I worked with AutoWorld on these cars and I hope collectors enjoy them. I thought it was cool to see them bring back the color chrome technique for the Centennial cars. 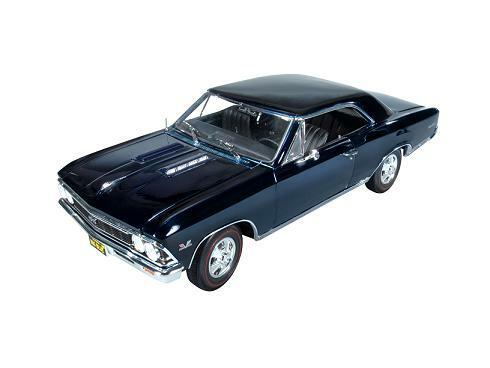 The Danube Blue 66 Chevelle is a pretty close replica of a well-known 1:1 and the 70 Chevelle will be painted in special order LeMans Blue and is another replica of a rare and awesome 1:1 70 Chevelle.